Home › Autism Breakthrough › Order Here! I learned more about my daughter by reading this book than I have through all of the others I’ve read over the 11 years since her diagnosis. In Autism Breakthrough, Raun K. Kaufman shares his personal journey with his signature enthusiasm and energy. Similar to his speaking style, Raun writes as if he’s having a personal conversation with you in your living room. If you’re a parent of a child with Autism, this book truly is a must-read. With case studies, step-by-step instructions and an accompanying website, it’s an invaluable resource that may prompt you to rethink what – and how – your child can best learn and progress to meet their full potential. No matter how old your child is, Autism Breakthrough can help you to connect with them in ways you may have never thought possible. passionate and articulate spokesperson for the Autism community. Thanks to The Son-Rise Program®, an innovative program his parents created, Raun experienced a full recovery from Autism. 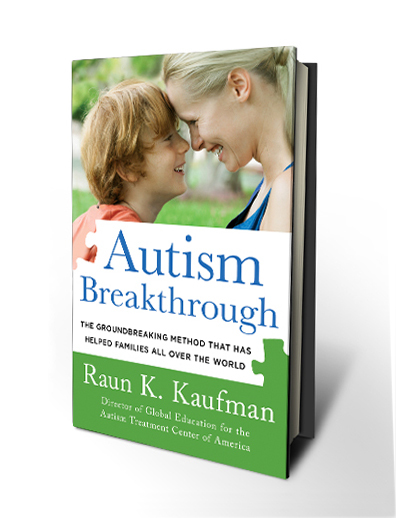 In Autism Breakthrough: The Groundbreaking Method That Has Helped Families All Over The World, Kaufman presents the powerful principles behind the program that helped him, and so many other families with special children. Kaufman explains that Autism is frequently misunderstood as a behavioral disorder when in fact it is a social relational disorder. He explains what it feels like to be autistic, and shows how and why The Son-Rise Program, which focuses on the parent-child connection, works. And Kaufman offers clear, practical strategies for working with children that readers can apply immediately—in some cases, parents see a change in their children in as little as one day. Autism Breakthrough makes available for the first time in book form the principles and practical applications of The Son-Rise Program, presented by someone who not only teaches the program, but has experienced the joy of it in his own life. Autism Breakthrough opens totally new doors and shows how to join children in their own unique worlds instead of demanding that they join ours, which makes it possible for these special children to defy their original often-very-limited prognoses. It’s an essential book for all parents, family members, educators, psychologists, occupational therapists, speech language pathologists, special education teachers, pediatricians, and people with an interest in Autism Spectrum disorders. AUTISM BREAKTHROUGH is Available Now!. Order your copy today from major book retailers including Barnes and Noble, both in-store and online.